The story of America’s Army is told in many ways—through the acts of bravery of individual Soldiers and small units, in the symbolism of unit patches and the distinctive emblems of branches and regiments, and by the naming of posts, camps, stations, buildings, streets, training areas and firing ranges. Each of these contributes to the legacy of the Army and to Army history and reminds Soldiers that they do indeed follow in the footsteps of giants. 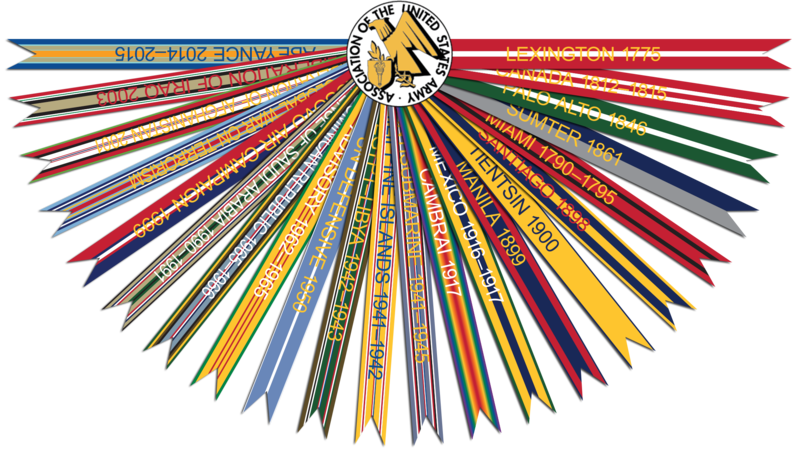 But, arguably, no collection tells the complete Army story more clearly, more powerfully, than the campaign streamers affixed to the Army flag. From Lexington to the ongoing campaigns of today, the Army’s streamers span the history of our nation and our Army. They reflect the sacrifice, service and honor of the American Soldier through many generations and remind us all how different our nation would be but for those who have worn the uniform of our nation in the hardest of times. The Association of the United States Army’s Institute of Land Warfare has updated this book, recognizing the many changes that have occurred since it was last published in 2009. We hope you find it informative and useful, but more important, we hope you find it inspiring. At AUSA, we are proud to honor all Soldiers, past and present, and we dedicate this book to those who have served, those in uniform today and those who will keep America’s Army strong for generations to come.